Here, mountains rise soaring towards the sky. The landscapes we cross are extremely varied, rice terraces, gigantic rhododendron, pine forest, and in the highest part a rock and shrub wilderness with the fascinating backdrop of snow capped peaks. This trek also provides a chance to observe on of a holy site of Hindu and Buddhist the sacred Gosainkunda Lake. We cross the Laubrebina Pass (4660m) and drop into the lush Helambu region and different cultural experiences eventually finishing the trek an hours’ drive from Kathmandu. 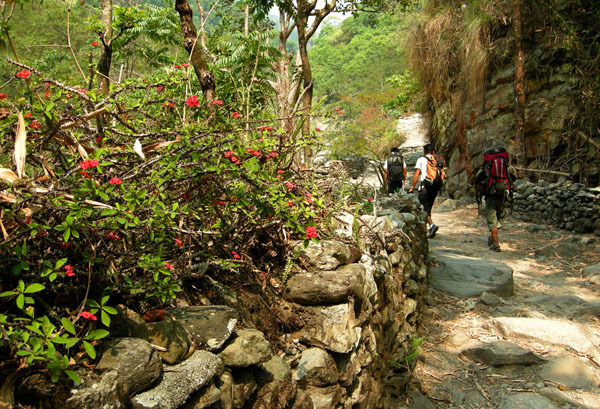 This trek offers fascinating views of Langtang range, Gamesh Himal, Dorje Lakap, Nayakanga and Langshisha etc. Day 3. Drive to Syabru Bensi 1460m. Day 4. Trek to Lama Hotel Changdam 2410m. Day 5. Trek to Langtang village 3330m. Day 6. Trek to Kyanjin Gompa 3730m. Day 7. A day hike to Kyanjin Ri 4600m / Tserko Ri 4984m and back to Kyanjin Gompa. Day 8. A day hike to Langsisa Kharka 4160m and back to Kyanjin Gompa. Day 9. Trek to Lama Hotel 2410m. Day 10. Trek to Syabru Village 2210m. Day 11. Trek to Sing Gompa Chandanbari 3250m. Day 12. Trek to Gosainkunda 4380m. Day 13. Trek to Chandanbari 3250m. Day 14. Trek to Dhunche 2030m. Day 15. Drive back to Kathmandu and Hotel. 1 – 4 pax : 1400 USD. 5 – 8 pax : 1320 USD. 9 or more : 1290 USD. - Food, 3 meals a day on Trekking. - Lunch & Dinner in Kathmandu.